Editor's Note: This is the first post in Guide for the Guild, a year-long series of blogs posts submitted by AAR members in response to the Status on Women in the Profession Committee's work-life balance project. To learn more, visit SWP's page on the AAR website. I spent my first semester of graduate school in survival mode maintaining my studies and TA obligations through the shock and vicious morning sickness of a surprise pregnancy. My second semester was consumed with grief and physical recovery over a miscarriage at seventeen-weeks, six days before my first class. With my reserves for stress management depleted and my sense of direction shifted for the third time in less than six months, I succumbed to the existential self-questioning inherent in any major loss. Compounding this disorienting time was the bewildering timing of these events at the very outset of my midlife transition from professional at-home motherhood, returning to school and upgrading my role in the professional world. What was the meaning of it all? Trying to view the crisis as a meaningful moment in my own life journey may not have been the wisest move during the semester. It raised questions that could not be answered in any objective, external way. What was I supposed to get from all this? Was life telling me I needed to stay home, continue to build my life more around family, have another child? Was this hurdle placed in my path to sharpen my drive for a midlife career shift? The only answers lay within, in what I wanted them to be, and it was impossible for me to know what I wanted during this time. I felt the work-family divide as a visceral reality. The end of that semester brought me a sense of closure and clarity. My enthusiasm returned as I found myself revising my strategies for the next year, planning the summer with my children to include activities that met their needs and trained them in better habits to meet my needs in the coming year. The answer which bubbled to the surface was this: After months of struggling through seemingly separate details, I needed the big picture. Some people express this big picture in terms of a greater purpose or personal fulfillment; I think in terms of wholeness. I need to see career and home life as the public and private expressions of the same self. Who am I? I have an analytic mind, I am a passionate learner and teacher, and writing centers and energizes me. What other career path will satisfy this skill set? The love and challenges of my husband and children and pride in my home are centered in a purpose and skill set which overlaps into my public domain: creating an environment for moving through life with awareness and supporting myself, my family (my students and colleagues) in our individual life quests for understanding, identifying obstacles to success, and negotiating solutions unique to each member of my family (student, class, or department). When I can see the wholeness of my life, not separate lives, it becomes easier to commit myself to this messy reality of negotiating the competing demands. The hurdles and obstacles in both the private and public parts of my life are not just par for the course, they are opportunities for growth unique to me and my path, inviting me to live with greater depth and richness. The greatest challenge is maintaining my whole well-being, nurturing my resilience so that I may read and ride the inevitable “waves” effectively. Self-care—be it vitamins, exercise, prayer, massage, girlfriend time, bubble baths, or a soupçon of emotional eating—can support us in finding our big picture, but more critically, self-care helps us stay centered within in it through the rough times. 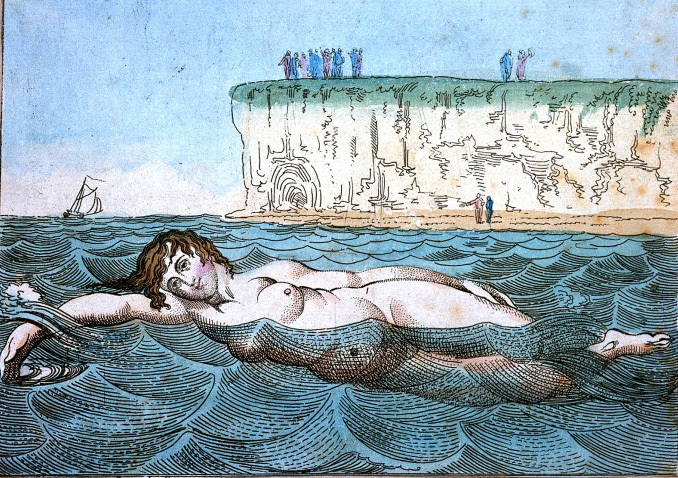 Image: Venus's Bathing, hand-colored etching by Thomas Rowlandson, c. 1800. Courtesy of Wellcome Library, London.